"Tomb and stele of Fr. Antonio Chen"
Tomb and stele of Fr. 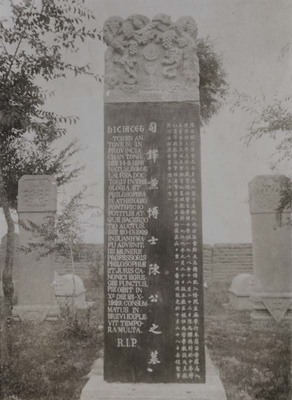 Antonio Chen (Tchen 陳) in the cemetery for priests; born in Shandong he earned a doctorate in Philosophy and Theology in Rome; ordained in 1928 he arrived in Xuanhua in September 1929 to teach at the major seminary but died two months later at the age 31. Tomb and stele of Fr. Antonio Chen. 1932/1933. Société des Auxiliaires des Missions (SAM) China Photograph Collection, Whitworth University Library, Spokane.